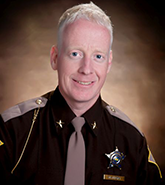 Matt Myers was elected as the 55th Bartholomew County Sheriff on November 4, 2014. Sheriff Myers has served the community as a law enforcement officer for more than 20 years. He has extensive public safety experience, serving as a member of both the Bartholomew County Sheriff's Office and the Columbus Police Department. After starting his career as a corrections officer at the Sheriff's Office under former Sheriffs Rick Hill and David Mann, Myers joined the Columbus Police Department in 1991 as a patrol officer. In his 22 years with the police department, Myers has served 11 years in supervisory and command positions and was Assistant Chief of Police from 2008-2012. Myers has participated in state and national law enforcement education and training. He is a 2010 graduate of the FBI National Academy and has an associate's degree in Criminal Justice from Vincennes University. He also is a current member of the Su Casa Board of Directors. He is a life-long member of the Fraternal Order of Police. Myers is married to Kyra (Goins) Myers, and they have three boys, John-David, Kolsen and Nash. Myers and his family attend the Ogilville United Methodist Church. (9) on or before January 31 and June 30 of each year, provide to the department of correction the average daily cost of incarcerating a prisoner in the county jail as determined under the methodology developed by the department of correction under IC 11-10-13.
as prescribed in subsection (a)(8), commits a Class C misdemeanor. (c) The sheriff may supervise and inspect all pawnbrokers, vendors, junkshop keepers, cartmen, expressmen, dealers in secondhand merchandise, intelligence offices, and auctions. The sheriff may authorize any deputy in writing to exercise the same powers. As added by Acts 1980, P.L.212, SEC.1. Amended by P.L.344-1983, SEC.1; P.L.85-2004, SEC.12; P.L.63-2008, SEC.5. During his tenure with CPD, Lane served in several positions including Commander of the Narcotics unit. He is a graduate of Vincennes University and has completed courses with the Police Executive Leadership Academy and the Drug Enforcement Administration. Lane’s duties as Chief Deputy include planning, organizing and implementing all Sheriff’s Office operations and programs. 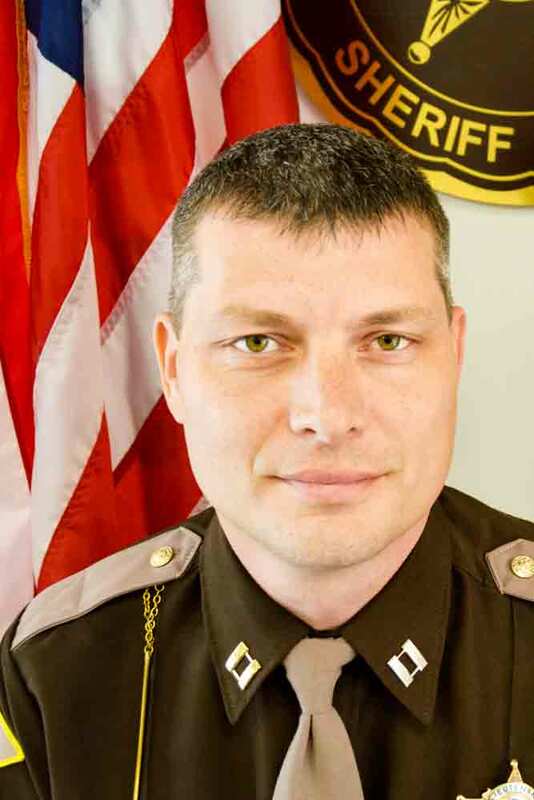 Myers said: “It is important to have someone in this position who has the ability and the experience needed to achieve the goals that we will set for the Bartholomew County Sheriff’s Office”. Major Martoccia’s responsibilties include all operational facets of the Bartholomew County Jail including compliance with numerous federal, state, and local mandates, overseeing a staff of fifty (50) full-time and part-time corrections officers and clerical personnel, support services, and daily operations that ensures the proper care and secure custody of BCJ inmates. In addition to overseeing Jail operations, Major Martoccia oversees all contracts for inmate programs and services, Courthouse security, food services, inmate medical requirements, inmate transportation, and inmate work crews. Captain Christopher Roberts is the Commander of the Bartholomew County Sheriff’s Detectives Bureau. Captain Roberts has served in many capacities at the Sheriff’s Office and has completed extensive training in a wide variety of disciplines. He is trained in SWAT procedures and recognized as an authority in technology matters. Roberts has also served as leader of the Dive Team, Deputy Commander of Water Rescue, and Coordinator of the Domestic Violence Project. Roberts is a graduate of Columbus North High School and Vincennes University with an Associate’s degree in Law Enforcement. Capt. Brandon Slate has worked in several areas of the Sheriff’s Office: in the Jail as a Corrections Officer and as a Merit Deputy in the Road Division, Detective Bureau, and Narcotics Division. Capt. Slate was promoted to Sergeant in October, 2012, and worked as a 3rd shift supervisor. In January 2015, he was promoted to the rank of Lieutenant as the Deputy Road Commander. On May 4, 2015, Slate joined the Sheriff’s Leadership Team as Captain of Administrative Services. Capt. Slate is a graduate of Columbus North High School. He and his wife, Ashley Slate, have two daughters. Capt. Slate’s parents are Mark and Denise Slate. Captain Steinkoenig is a long-time resident of Bartholomew County. He is a graduate of Columbus North High School, the Indiana Law Enforcement Academy and a veteran of the United States Air Force. He has served in several capacities with the Sheriff’s Office: Road Division, Detectives Division, and, for 7 years as a Sergeant in the Narcotics Division. 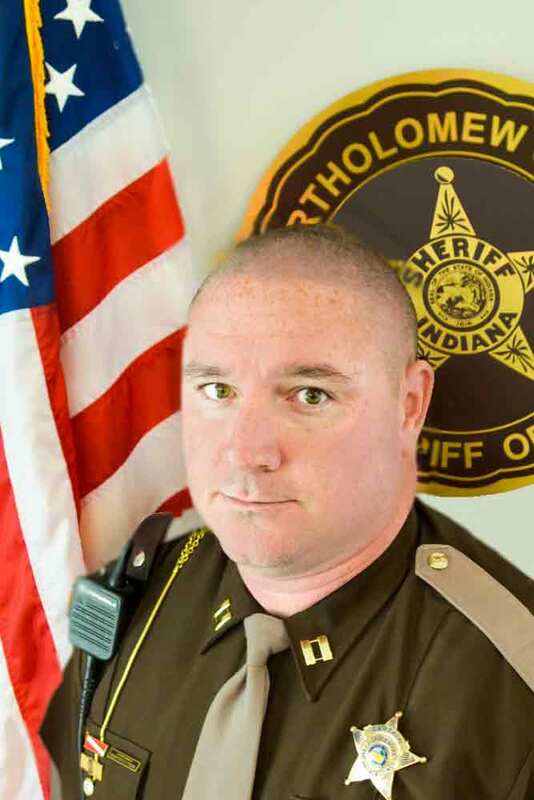 Steinkoenig is a firearms instructor, Taser instructor, a member of the Dive and Water Rescue Team, and a member of the Bartholomew County Substance Abuse Council. As Matron, Vicki has numerous and diverse responsibilities and must coordinate complex activities. Examples include: tax warrant collections, bookkeeping, supervision of BCSO’s Records Division, processing payroll and managing the budget for the Sheriff’s Office. Vicki also has an active role in employee policies and procedures as well as employee benefits. Sheriff-elect Matt Myers appointed Jeffrey L. Beck as the attorney for the Bartholomew County Sheriff’s Office. Beck, a partner in the law firm of Beck Rocker, P.C., is a native of Bartholomew County. 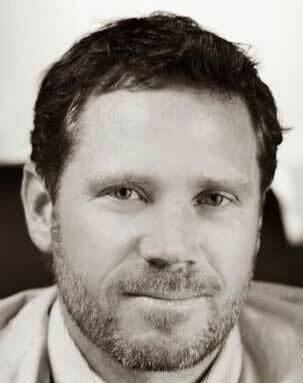 He is a 1993 graduate of DePauw University and a 1997 graduate of the Indiana University School of Law – Indianapolis. He is a member of the American Bar Association, the Indiana State Bar Association, the Indiana Trial Lawyers Association and the Bartholomew County Bar Association. “Jeff’s experience, knowledge of the law, knowledge of our community and uncompromising standard for excellence makes him highly qualified for this position”, said Myers. “He [Jeff] is a dedicated professional who will provide sound legal counsel and maintain the integrity of the Sheriff’s Office. He is a great addition to my administration and I look forward to working closely with him”, said Myers. Launched in 1972, Neighborhood Watch counts on citizens to organize themselves and work with law enforcement to keep a trained eye and ear on their communities, while demonstrating their presence at all times of day and night. (The program took off quickly: in just ten years, NSA data showed that 12 percent of the population was involved in a Neighborhood Watch.) Neighborhood Watch works because it reduces opportunities for crime to occur; it does not rely on altering or changing the criminal’s behavior or motivation. Work with the police or sheriff’s office. These agencies are critical to a Watch group’s credibility and are the source of necessary information and training. Gather the facts about crime in your neighborhood. Check police reports, conduct victimization surveys, and learn residents’ perceptions about crimes. Often, residents’ opinions are not supported by facts, and accurate information can reduce the fear of crime. For 25 years, the Bartholomew County Sheriff's Office has been actively involved with the Drug Abuse Resistance Program (D.A.R.E. - Drug Abuse Resistance Education). The collaborative effort with the Bartholomew Consolidated School Corporation has achieved a high level of success. Currently, Deputy Jessica Pendleton is assigned full time as the D.A.R.E. Officer. She also serves as a School Liaison Officer who would handle any juvenile/student issues that may arise throughout the school day. She also represents the Sheriff's Office at special school events. Prior to being appointed as the Sheriff's D.A.R.E. Officer, Deputy Pendleton worked as a Reserve Deputy, Jail Officer, Merit Deputy and K-9 Officer. 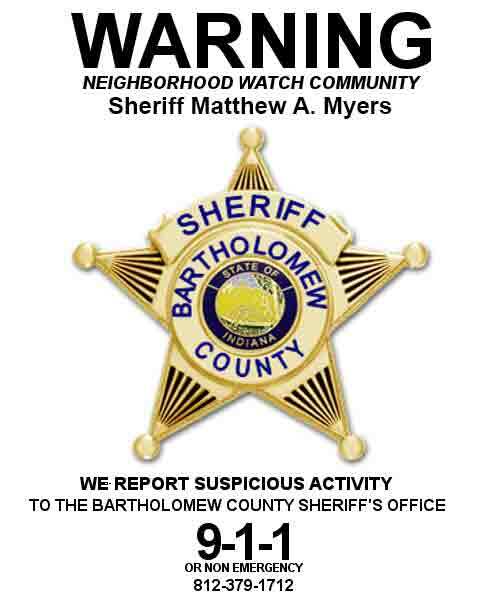 Bartholomew County Triad is an organization under the auspices of the Bartholomew County Sheriff’s Office. Volunteers assist seniors and people with disabilities in Bartholomew County by connecting them with local organizations, and services. enable them to remain in their homes as long as possible. Visitors - must be at least 18 years of age and all visitors must present a valid photo ID. Bonds- Cash bonds are accepted at the Clerk’s Office Mon-Fri 8 to 5. After 5pm bonds are paid at the jail. We accept cash and credit card bonds at the jail. Property is no longer accepted. All clothing and inmate footware can be purchased off of commissary. We will not accept books. A Sheriff Sale is the result of a court ordered bank foreclosure for the non-payment of a standard monthly mortgage. This type of sale should not be confused with "Tax Sales" which are held twice a year by the Bartholomew County Auditor's/Treasurer's Office for non-payment of real estate taxes. Sheriff Sales are held on the second Tuesday of each month at the Bartholomew County Sheriff's Office located at 543 Second Street in Columbus, Indiana. All sales will be conducted "orally" (oral bid only) and bidding starts at 10:00 a.m. or as soon thereafter as possible. Buyer Beware! All properties are sold "as is". It is highly recommended that anyone purchasing a house at Sheriff Sale do their "homework" and have a title search done as well as checking with various county offices for information concerning the property. 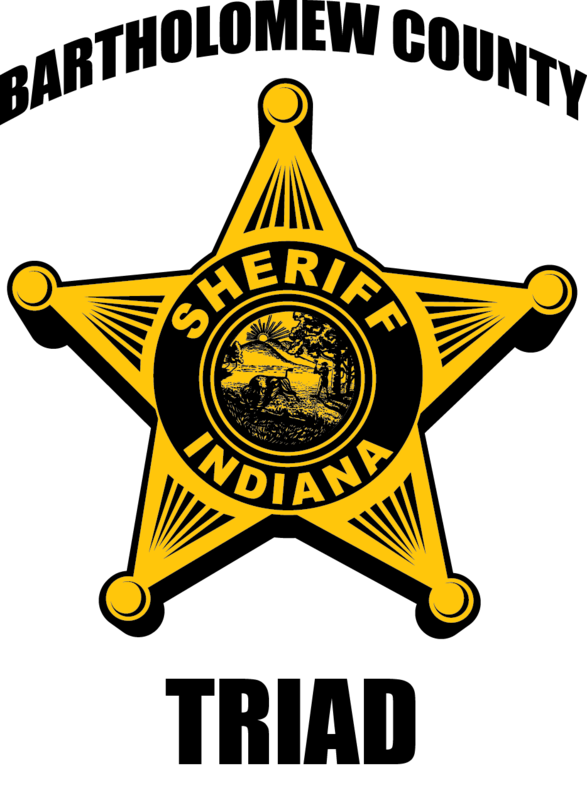 Upcoming Sheriff Sale dates can be viewed on the Calendar, located in the menu at the top of the page or on the County home page. Sales may be cancelled between posting date and sale time. *NEW* Cancellations are noted as they come in throughout the month on the Monthly Sheriff Sale List which may be downloaded from this page. Should you have questions, call the Bartholomew County Sheriff's Office at 812-565-5934. Should you reach voice mail, please leave a detailed message for a return call. The Sheriff is required to record these documents immediately after the sale per SB-492 Recording Sheriff Deeds. Any delay in receiving these documents will result in the deed and sales disclosure not being recorded pursuant to the statute, and the sale may be voided.